Do you feel like you have been on an endless search for a quality latex mattress? Do you love all natural mattresses? Worry no more because the Zenhaven Mattress is here. This is an all natural, latex mattress from Saatva designed to provide optimum comfort. In this post, we explore the features of this mattress to see if it is worth the money. 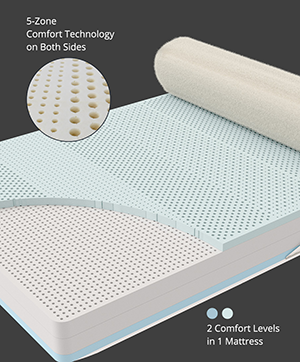 The Zenhaven Mattress is a unique mattress that is extremely comfortable and does a great job of minimizing motion transfer as well as sinkage. It is soft and supple yet provides responsiveness and bounce, cradling your body where it most needs it. Top layer: The uppermost layer is made up of 1.5-inches of latex with a 5-zone system for ultimate comfort and bounce. Second layer: This is a 3-inch layer of Talalay latex with an indentation load deflection of 25-29. The ILD is a measure of softness or hardness of the foam. That said, this layer is purposely designed to provide a high level of support. Third layer: This is made up of 3-inch Talalay latex with an ILD of 30-34, which makes for pretty good transitional support layer. When flipped to become the second layer, it provides more immediate firmness, support and push back. Bottom layer: Like the top layer, this is made up of 1.5 inches of latex and acts as the top layer when the mattress is flipped. 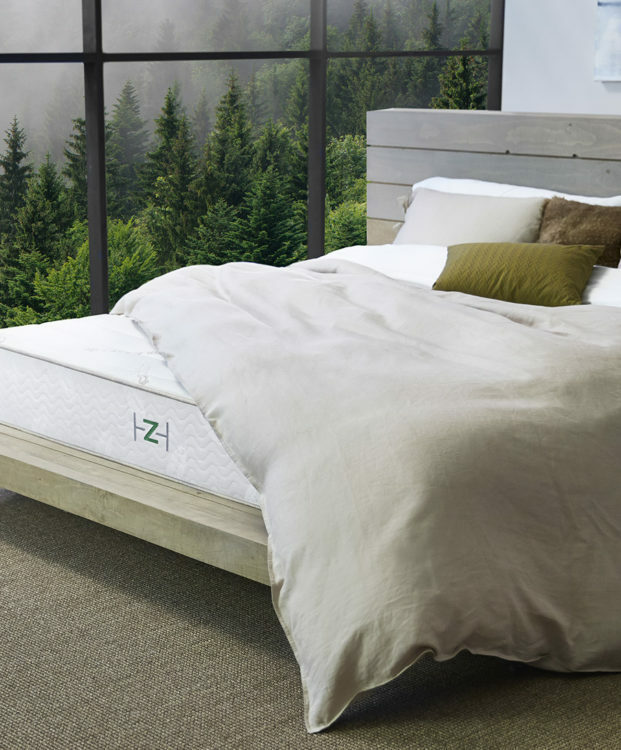 The flippable design of the Zenhaven Mattress means that it has two firmness levels. The rating of the firmer side is about 6.5 out of 10 while that of the plush side ranges from 4.5 to 5 out of 10. Another aspect of mattresses is the feel and this strikes an excellent balance of sinkage, hug and pressure relief. The contour is a bit different from what you’d get from other mattresses, and provides adequate pressure relief and sinkage while eliminating the feeling of entrapment. The cooling on this mattress is incredible especially since is made from 100% latex, which doesn’t retain heat. The latex layers of the Zenhaven are aerated, hence improving breathability. The bottom portion of the mattress cover contains Joma wool, which helps keep Zenhaven cool even when the temperatures are high. The degree of bounce is probably Zenhaven’s most notable feature. This mattress responds to pressure incredibly and almost immediately, thus ensuring a solid degree of bounce. The cover of this mattress is constructed using organic cotton and sewn into the lining is a layer of Joma wool. Being a natural temperature regulator, the Joma wool helps maintain a cooler sleeping surface by pulling away heat from the mattress. There is also a layer of Joma wool on both sides of the Zenhaven mattress for ultimate cooling even when you flip it. The wool is also dust mite resistant, anti-microbial and hypoallergenic. The Zenhaven is a 100% Talalay Latex mattress that incorporates a two-in-one design that’s suitable for most sleeping positions. Despite being expensive, the premium materials in design provide a comfortable and supportive mattress for any sleeping position. Need help deciding what aspect of a mattress actually matter? Then this section is for you. Latex mattresses are available in three variations i.e. blended, natural and synthetic latex mattress. Depending on your budget and quality of sleep you’re looking for, you can go for any of the above. Natural latex mattresses are of the highest quality but that also comes with a high price. Blended mattresses provide a good balance between quality and affordability. Look for a mattress that is medium firm to firm. Soft is good for someone who isn’t heavy or if only one person is to use the mattress. Take care not to choose something that’s too soft as it won’t be able to support your weight and you’ll end up with a sore back. A latex mattress should be able to provide adequate support as well as pressure relief where it’s needed most. This is particularly important for someone who turns and tosses in their sleep. PrevPreviousHypnic Jerk: Should You Be Worried About Twitching In Your Sleep?